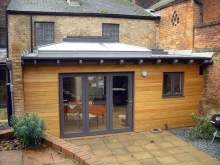 Extensions and alterations to a Grade II listed house. 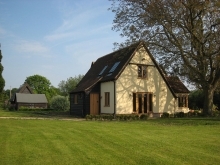 Opening up the rear section of the house and refurbishing throughout has transformed this listed timber framed building. A new kitchen, with lofty ceilings and exposed timber framing, links through to a new airy dining space where tall glazed doors give access to the garden. 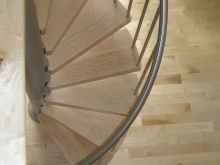 A new staircase with a curved oak handrail forms the focus at the end of the space and leads up to a previously isolated bedroom. Substantial alterations to raise the main roof in the 18th Century led to the original rear wall becoming enclosed, with subsequent divisions creating small, cramped spaces. By removing ceilings and partitions the original timber frame of the rear wall has been fully exposed. Below the studs which had jacked up the roof, the original 17th Century frame is now clearly visible and includes a diamond mullioned window. The timber frame has been carefully and comprehensively restored and now serves an important structural, visual and historic role.